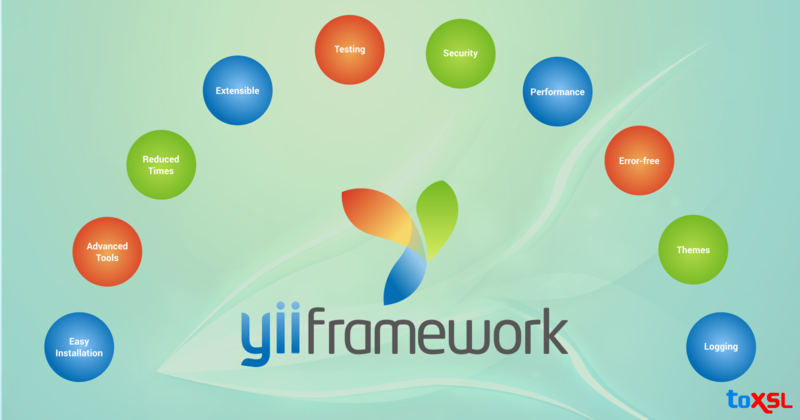 One of the most preferred frameworks on which customers rely for web development is the Yii framework. Yii framework, which got established in the year 2008 has successfully acquired an impressive identity in the IT industry in no time. Yii is a PHP framework for the application of all type of web applications. Its MVC design pattern framework and the enhanced security features make it stand out from the other frameworks. Want to know how Yii framework can benefit to your organization? Here is a list of best features Yii framework holds and definitely they will force you to choose Yii for your next project! Easy to install: Too much time spent on the installation process directly means a wastage of time and money. Yii comes with an easy to install and configure process in an uncomplicated manner. Advanced technology: Yii implements the OOP framework and uses PHP's more advanced features including the SPL classes & interfaces, static binding anonymous functions. Reduced development time: Nobody loves spending huge time on repetitive tasks. Yii comes with tools to assist you to perform repetitive tasks in a short span of time. Fully extensible: What makes the framework a unique one is its capability to be tailored to fit the customer needs. Its component is virtually extensible which makes it stand out from other frameworks. Testing: Codeception, one of the PHP testing framework is an integrated framework which makes Yii more attractive to the customers. This helps in simplifying the process of creating, acceptance & functional tests for the application. Better performance: Slow websites always result in frustrated customers it? Yii framework offers you several tools to get more speed out of your app. Its cache components allow you to choose any caching system of your choice with a common API. It supports database and file system caching, Wincache, Redis, APC, XCache, and Zend Data Cache. Handling errors: Based upon PHP 5 Exception mechanism, Yii has a thorough error handling strategy. The handleError method in Yii handles the uncaught PHP exceptions during the incoming user requests. Themes: To customize your web pages and give it a better look, Yii comes with a variety of themes available. You can by choosing a suitable theme. Every theme under Yii has a set of other necessary resource files such as images, view files, etc. Logging: Yii includes the logging feature which allows you to classify the logged messages and then you can route them to different destinations accordingly like emails, files, or browser windows. Unlike other frameworks, Yii assists you in creating web applications quickly and ensures a better performance. It would be perfect choosing Yii for your next project as you can get everything done smoothly and reliably. Still, have queries or questions regarding Yii framework? Get in touch with us, we assist you with 24/7 services!